Blackpool’s iconic Central Pier has been put up for sale by the owners Cuerden Leisure for 4.8 million. The company are also selling Llandudno Pier (4.5 million) and Blackpool’s South Pier (3.3 million). The owners are restructuring their assets, says director John Stott. Blackpool Central Pier was built in 1864 and is 341 metres long, significantly shorter than it’s sister the South Pier at 150 metres, but neither are listed buildings. When I first walked onto Blackpool Central Pier, it was as a little girl in the 1960’s. My grandparents invited two of their grandchildren on this annual trip which always took place during the first two weeks in August. The excitement that we experienced walking through the entrance gates and onto the echoing wooden decking of the pier, never failed to thrill our nerves with excitement. We were generally on edge anyway, as my grandmother suffered from anxiety and would terrify us with her over protective habits. I loved her, still love and miss her 27 years after she died, but those warnings of strangers, cars and their fumes, the sea, the sun, germs in the water and the food, gave us constant and fevered anticipation of the terrors lurking all over Blackpool. I understand now, that she was just worried for us. I imagine that if she were to take us to Blackpool for our holidays today, she would not allow her four and five year old granddaughters to leave the B and B we stayed in. The horrors have become real. The last time I visited the town, I found it to be dirty, smelly and tacky. I was so disappointed that it had changed that much in the intervening years. We walked to Stanley Park and to the Pleasure Beach clutching our few coins often during our fortnight’s stay. There was a trip to Fleetwood and a trip on the ferry and visits to the Tower Ballroom, the Winter Gardens and the Olympia on the evenings we didn’t go to the Pleasure Beach. Ice cream from Pablo’s down the back of Albert Road and rock from the shop by the Tower were only weekly treats. We never went up the Tower, I think Grandma would rather have shot us all than experience that caper. I had wanted a dog, specifically a German Shepherd puppy, as soon as I learned that my mother had made my father give away his German Shepherd, (in addition to selling his beloved tenor saxophone) as soon as I was born. When I was told this, I regularly had nightmares and worried constantly about what had happened to Dusky and whether mother had had him put down and not really given him away. So I used to beg and beg for a puppy and the answer was always no. Dad said yes, but mother ruled the home. I tried a new tack and began saving pennies in a jar and put in all my pocket money in order that we could save up the £10 cost of a GSD puppy. My siblings soon joined in and I know Dad often put in his loose change when he passed the jar. Eventually we had saved up £6 and mother capitulated under the constant,”Can we have a dog please?” repeated ad nauseum by the family. Dusky number 2 was bought as an 8 week old puppy in Leeds and fast became our best friend. She wasn’t allowed beyond the scullery or the kitchen and so I spent all the hours I was not at school or riding, walking her around the village. 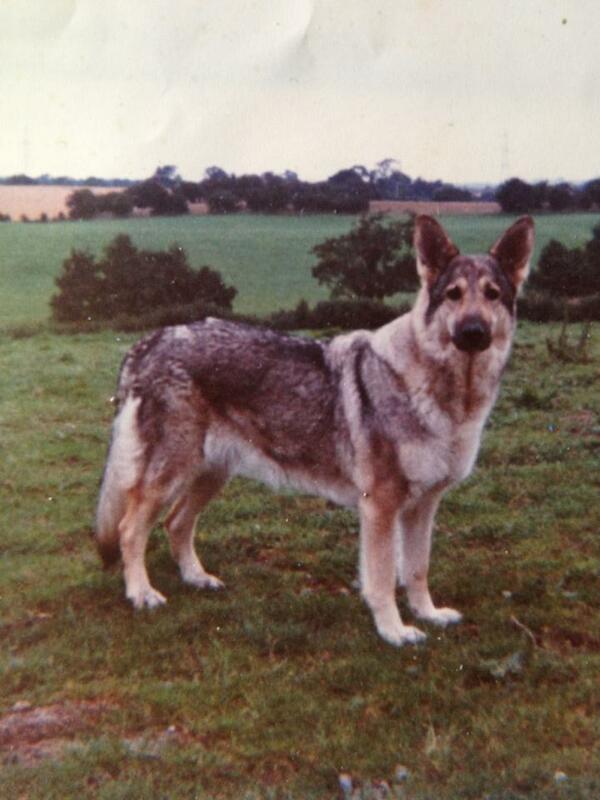 When we were not at home, mother would put Dusky in the shed or behind a fenced garden area. There were always arguments about the best way to look after her. 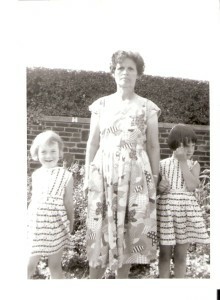 8 months later, Blackpool time arrived and in spite of weeks of arguing, I was forced to go to my grandparent’s house. I desperately wanted to stay with Dusky and was not convinced of mother’s assertions that she would be accompanying them on their Cornish holiday. I can remember the painful feelings of missing the trip to Cornwall, where I considered to be my real home and leaving my beloved Dusky. But, I had to accept the faithful parental promises that Dusky would be looked after and that four weeks away wasn’t that long. I was suitably sullen during the Blackpool trip and when we regularly walked to the end of the Central pier, I leaned over the railings, trying to mentally connect with my beloved dog and let her know that I would never leave her again. During the miserable time we spent in Blackpool, there was an unusual and unique occurrence. Towards the end of the second week, a letter arrived from mother asking us how we were and saying that we were not to worry, Dusky was fine. Fine? Why write to tell me that? Mother never wrote. She always seemed to be glad to be rid of us. The postmark was Melton Mowbray, not the Cornish address. I was suspicious, being a thinking sort of a child. I was also clearly an unconscious Freudian. I was now sure that Dusky was not fine, but what could have happened? In those supposedly halcyon days before mobiles and internet, I had to wait until the end of August before I found out that my mother was a big fat liar. Almost as soon as we had been established at Grandma’s house, Dusky was loaded into the car and taken to the kennels in Melton Mowbray, where she was to stay until my parents returned from their Cornish trip. Dusky, already upset at having been left by me, struggled and complained and threw up in the car. In spite of this, Dusky was deposited at the kennels and my parents drove joyfully away. After all, Ann could not possibly discover what they had done, could she? However, Dusky immediately panicked and climbed out of her kennel and jumped over the high fencing which surrounded the enclosures there. By the time my parents arrived home, there was a message informing them of what had occurred and they had to return to the kennels, immediately. The story is much longer than I am going to give it space here, but it took almost a fortnight to find her. The parents had to speak to everyone they saw, including farmers, landowners and police. There was a real fear that a hungry German Shepherd wandering the lanes alone, inferred sheep killer and was likely to be shot. The local paper and radio became involved and many people began looking for her. My parents were unable to leave for Cornwall and so one day while searching, it was they who managed to catch Dusky in response to a landowner’s telephone call informing them they had spotted Dusky running down their lanes. No one else had been able to catch her. The parents then took the thinner and quieter Dusky to Cornwall with them. By the time I heard this story I was absolutely livid and it was one of the reasons I never again trusted my parent’s word. I remember taking Dusky for a walk as soon as I arrived home, muttering that I would NEVER do that to my child. I don’t think that I ever have. I learned that a person can lose their integrity with one event and never get it back. And as a result of this, I never returned to Blackpool with Grandma, and a younger sibling was sent in my place. So, if you are considering digging into your savings to buy either of these piers, know that at the end of one, lies much of my family jewellery inheritance and at the end of the other, lies some of my childhood beliefs.